It’s funny, despite the Spelunker series being around since 1983, there have actually been very few releases during its 30-plus year run. So few in fact that Spelunker Party! is essentially my very first venture into the wickedly tough exploration-based platforming the series is known for. Has my time with the game been an epic quest worth retelling for years to come, or a nightmarish trip best forgotten though? You wouldn’t be blamed for thinking the game shares a couple of similarities with some free-to-play efforts out there, Spelunker Party! itself an updated version of the free-to-play Spelunker World on PlayStation 4 and PlayStation Vita. However, fret not as the Nintendo Switch version is the complete package – removing any signs of microtransactions. What you have instead is a pretty linear adventure that leads you (and your friends if you like) stage-by-stage deep through caverns, mines and ruins in the hope of discovering the strange goings on after a recent comet crash. Spelunker Party! is a tough game. Very tough in fact and even though you’re granted five fresh lives every time you tackle a stage, you’ll still find yourself facing plenty of game over screens often times unfairly. While the platforming itself can be very precise and oftentimes gruelling with every jump requiring near perfect timing and every obstacle needing a patient and thought out approach, it’s made all the more frustrating thanks to the game’s determination to follow its own far too strict rules. Where a mere leap on a downhill slope or early jump off a swinging vine could kill you instantly. What’s worse is you never know what may prove fatal and what the game will allow. Rather than reward daring behaviour, the game chooses to punish it. As an explorer, this feels very backward. And while other 2D platformers may have you control a very able and athletic hero, Spelunker Party!’s star is quite the opposite with controls very rigid and their options limited due to his or her fragile nature. Even more stressful is having to monitor your character’s energy level every step of the way keeping it topped up at checkpoints and preventing it from depleting completely. It’s a mechanic that the game could have done without and doesn’t really add anything proving more of a nuisance than anything else. The platforming genre has moved forward in some rather interesting directions over the years and while it’s certainly admirable that Spelunker Party! aims to stick its well-established formula, frustrations and all, it, unfortunately, makes for a rather uninspired and dated experience. Take the level design as another example. Stages start by easing you in nicely introducing you to the idea of swinging on vines, grabbing treasure and keys and using the items at your disposal before throwing in more enemy types and obstacles the further you progress. Still the procedure rarely detracts from what is essentially searching for randomly scattered keys to open a series of locked doors and before long the whole experience does start to drag. It just doesn’t surprise you. Even when the game throws a boss battle your way or a new obstacle, the ordeal isn’t anything you’ve not seen before nor is it done in any fresh-feeling manner. I’m not trying to say the experience is bad by any means, it’s just very average. Fortunately adding other players to the mix helps keep things from growing too repetitive, the game opting for a split screen approach and everyone free to explore wherever they want within a stage. Again though, the game’s high difficulty may result in weaker players dragging the whole team down with them. This is very much an experience that is best had with people who know Spelunker Party!’s specific traits. 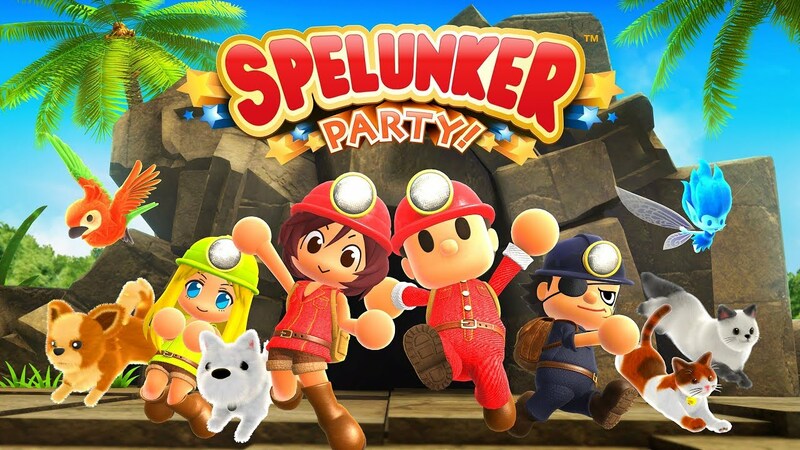 If you’d rather play with others online Spelunker Party! has you covered too although I did have a bit of a tough time finding players to join. Of the few games I did find, the lack of voice chat is noticeable and means playing locally is definitely the better option. The game offers a decent number of stages to work your way down all playable either alone or in multiplayer each with three point targets to beat. Every level also houses a number of Litho-Stones which unlock new items to equip to your pioneer. The items themselves not only change the appearance of your character but also award perks too such as an XP boost or increase to your bomb explosion radius. You can even unlock pets that might help dig up more treasures along the way. Handy for sure but not enough to make me want to go back and repeat older stages to find extra Litho-Stones I may have missed. Spelunker Party! while cute in appearance also veers too close to bland, the environments very basic in look and the characters themselves lacking any real… well, character. Sure, you can unlock new outfits but at the same time, they feel a little unexciting and generic for example a fireman’s helmet or mining helmet. This goes for the soundtrack too which is forgettable at best. All in all the overall presentation much like the gameplay is adequate but nothing more. Spelunker Party! is the kind of game that fails to make any real lasting negative or positive impression. It’s a better experience when played in a group, however, the game’s overall mix of frustrating platforming, bland presentation and uninspired level design mean this is a party you might want to pass on.